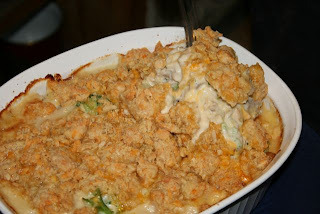 Remove from heat and add Alfredo sauce, chicken, 1-1/4 cups Cheddar cheese, and the fresh or frozen vegetables; stir gently. Place in 2 quart casserole. At this point, you could cover and refrigerate up to 8-24 hours or follow below instructions. When ready to eat, preheat oven to 375 degrees F. Place casserole, covered, in oven and bake for 25-30 minutes until warm. Meanwhile, in small bowl combine flour, baking powder, 1/4 cup butter, 1/2 cup Cheddar cheese, Parmesan cheese, and egg and mix with a fork until crumbly. Uncover casserole and crumble this topping evenly over the top. Bake for 20-30 minutes longer, until filling bubbles and the topping is golden brown and crisp.